What other organizations do similar work to yours? GVS is proud to cooperate with and support other organizations with similar goals. One of them is the Afghan Friends Network which was founded in the San Francisco Bay area in 2002. This nonprofit organization enables friendships and partnerships between individuals, organizations and cities in the United States and Afghanistan. Is GVS related to Mercy Corps? Mercy Corps has helped GVS with logistical support, advice, and assistance but we are not formally associated. What religion are the students at the schools? Afghanistan is more than 99% Muslim and it is safe to assume that all students attending our schools are practitioners of Islam. However, people of all religious backgrounds are welcome. Does GVS have a religious orientation or promote any religious beliefs? 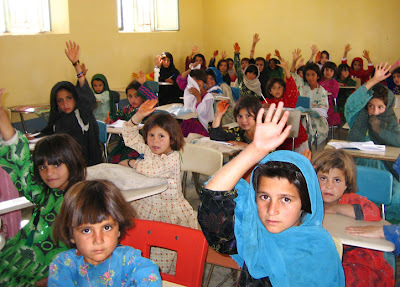 Our organization's goals are education, sanitation and the well-being of the people of Afghanistan. We have no formal religious orientation and we do not promote any particular lifestyle. Why are there fewer girls than boys in the schools? Many families, especially in rural areas, still worry about sending their daughters to school. This concern is changing as more people recognize the quality and integrity of our schools. I am an educator and I want to teach my students about Afghanistan. Can you recommend a curriculum for my class? Mercy Corps produced a curriculum guide on Afghanistan for educators. The guide contains classroom ideas and activities on a range of topics related to Afghanistan, including ones that move beyond common themes of war and crisis and highlight the country’s rich cultural heritage. Click here to view the curriculum guide. Additional information on various aspects of life in Afghanistan including history, culture, war, Islam, women and cuisine is covered in the book, "Afghanistan Revealed", published by the UK based Afghan Appeal Fund which is sponsoring the rebuilding of our first school in Shin Kalay. What types of donations are you accepting? Currently we are accepting only monetary donations. It is cheaper and more reliable to purchase supplies locally than to ship them from here. Small volume, high value items might be hand carried by Mohammad. Please contact us if you have questions about specific non-monetary donations. Yes. Green Village Schools is a 501(c)(3) nonprofit organization. Please contact us for the tax ID number or recent tax return.